Commence a new day in Sapa by a warm welcome from a local Hmong guide who leads you on village treks past magnificent terraced rice fields to meet ethnic minority groups that populate this northern region of Vietnam. Authentic Walking and Homestay Sapa Tour 4 Nights 3Days is one trip of lifetime with a combination of active exploration. When taking this impressive itinerary you will have chance to meet Black H’mong, Giay, and Red Dao minorities who live in the villages stretching along the dreamlike Muong Hoa Valley. Explore the different cultures and learn more about rice. 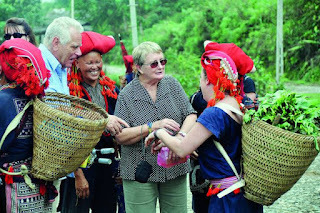 Surely, the uncommom landscapes and unique local cultures in the mountainous area of Northern Vietnam will bring you a great journey as your wish. Tag: Authentic Walking and Homestay Sapa Tour 4 Nights 3Days, Fansipan tours, Sapa Tours, Sapa trekking tours.